Gov. 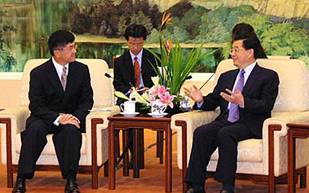 Gary Locke has established unprecedented relations with China through three previous trips that resulted in millions in sales for Washington businesses and farmers. Locke will lead a delegation of Washington state business, agricultural and education leaders on a trade mission to China and to Vietnam Sept. 15-24. The mission will develop additional markets for Washington state products and services. It is important that Chinese companies recognize Washington state as a leader and a major market for trade and investment. China is a member of the World Trade Organization (WTO) and will host the 2008 Olympics. Washington state recently added a trade representative in Guangzhou, China, to complement the services provided by the office in Shanghai and Washington State Department of Agriculture's agricultural trade representatives in Shanghai, Beijing and Guangzhou to meet the increasing interest by the state's companies to export to China. These opportunities, as well as China's booming economy and desire for Western products, present immediate opportunities for Washington companies and farmers to become well established in the Chinese market. The decision to include Vietnam on this mission was based on the strong growth of this emerging market and the interest of Washington companies to develop or strengthen key business relationships. The Vietnamese market offers a great deal of promise, especially in the areas of agriculture and infrastructure construction. Since the market's potential remains largely untapped, it is an ideal time for Washington businesses to explore current prospects and position themselves for the future. Furthering trade, education and cultural relations with both countries. Washington state exported more than $2.3 billion in goods and services to China in 2003, more than any other U.S. state except California and Texas. In 2003, China was Washington's third largest export market (Japan and Canada were first and second respectively). The aerospace sector comprised 76 percent of our exports to China in 2003 (approximately $1.8 billion), with other industries such as paper/wood products, food and agriculture, electronics, industrial machinery, and medical/surgical equipment showing strong growth potential. China ranks among the top five most-desired future export markets by Washington state companies, according to a survey conducted by the state Department of Community, Trade and Economic Development (CTED) in 2004. The 2008 Olympics in Beijing will provide potential business opportunities for Washington companies as the Chinese government prepares for this event and invests in the infrastructure and other needs. The Chinese government has committed $26 billion for the Olympics. The governor, along with Liu Jingmin, vice mayor of Beijing, last year hosted more than 150 Washington companies at a unique seminar in Seattle designed to help businesses that want to participate in the design, construction and operation of the 2008 Olympic Games in Beijing. China's accession to the WTO is creating greater market access and more business opportunities for Washington companies and farmers. China is the only country in Asia that has maintained a Gross Domestic Product (GDP) growth rate averaging between 7 percent and 8 percent since the Asian financial crisis in 1997. The growing affluence in China is creating new market opportunities for Washington's products. The International Monetary Fund estimates that the size of China's economy could actually pass that of the United States as early as 2007. Industries such as aerospace/transportation, agriculture, wood/paper and building materials that constitute the traditional base for Washington state's economy have much to gain by further expansion in the Chinese market. There are also many opportunities for new growth industries, such as information technology (IT) and renewable energy. Vietnam now boasts the fastest economic expansion in Asia after China, with average annual growth of 7.4 percent during the past decade. In 2003, Vietnam attracted direct foreign investment worth more than 8 percent of its GDP, which is proportionally greater than China. Vietnam is working toward entry into the WTO, which the government hopes to achieve in 2005. The country is a market of 80 million people, with rapidly growing income levels. Goods made in the U.S. are well regarded, with a presumed high standard of quality. Vietnam's top-ranked growth sector is the IT sector. Valued at only $337 million in 2001, the sector is projected to reach $800 million by 2005. Telecommunications is also a key growth industry. Aviation is one of the top priority sectors for the Vietnamese government, considered a pre-requisite for supporting national economic growth. Annual growth in the sector is forecast at 10-15 percent, with total air passenger traffic reaching 17.5 million by 2010. Vietnam Airlines posted a $27.2 million profit for 2003 and projects 25 percent growth in its passenger business this year. The airline is planning an ambitious expansion of both passenger and freight services. Other key sectors identified for rapid growth include: power generation; transmission and distribution; industrial and packaging machinery; medical equipment; safety and security equipment; and environmental equipment. In 2003, Vietnam was Washington State's 13th largest export market, with exports exceeding $735 million. More than 90 percent of last year's exports were in the aerospace sector, but important opportunities lie in the key growth sectors mentioned above. Washington exported more to Vietnam than any other U.S. state in 2003, when aerospace products are included. Without aerospace products, Washington was the seventh largest exporter to Vietnam. The governor's trade missions are designed to spur economic recovery by creating increased opportunities in other countries for Washington businesses and farmers. Capitalizing on Washington's competitive advantage in international trade is part of the governor's economic recovery plan for the state. Work to make sure our state's products are not unfairly excluded from other countries due to tariffs and non-tariff barriers. The governor's June 2004 mission to Mexico resulted in projected sales of approximately $6 million. Delegates reported the trip exceeded their expectations in terms of establishing key business contacts crucial to building their future business with Mexico. As a result of the October 2003 mission to China, Washington trade mission delegates have reported $3 million in actual sales and projected sales of $40.3 million. Several Washington companies will be playing a major role in the design, engineering and construction of facilities for the 2008 Beijing Olympic games. The mission will allow prospective companies to make personal introductions to key Chinese dignitaries and discuss potential projects related to the Olympics. The governor's trade missions to Japan, China, and Mexico in the past two years helped Washington businesses and farmers sell products and services to some of the world's largest markets. The delegations returned with immediate new sales. They also returned with mutual business, agricultural and educational opportunities. The governor has encouraged resolution of trade issues and has helped open international markets for Washington's products and services, including the historic first-ever shipments of fresh Washington potatoes to Mexico in May 2003 and a breakthrough chipping potatoes shipments to South Korea in December 2003. Timing is critical to success. The governor's trade missions bring value to Washington state's business and agricultural sectors, and also create opportunities for future exports.